Lets get straight to the solution. Suppose you want to filter the Primary Contact lookup on the Account entity to show only contacts that belong to the data in the Parent Account field. On the forms OnLoad event write the following code. On the OnChange event of the Parent Account lookup mention the below code. After performing the above mentioned, I select "A Bike Store" as the Parent Account and click on the Primary Contact Lookup. 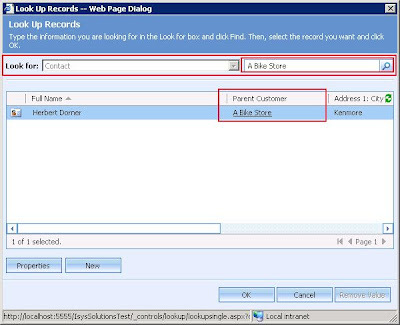 The Contact lookup opens(as shown in the figure below) and you can see "A Bike Store" in the search box & CRM is only returned those Contact records whose Parent Customer is "A Bike Store." This is a very real world code example. Please follow the exact steps as mentioned in the post to filter Primary Contact lookup based on Parent Account Value. Don't forget to tick "Event is Enabled" check box on the OnLoad and OnChange events. 1. On the OnLoad event of the Account form copy this code. Tick Event is enabled check box. 2. On the OnChange event of the Parent Account field, add this code. Tick Event is enabled check box. 3. 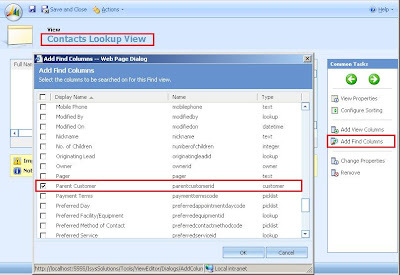 Tick Parent Customer check box for the Add Find Columns in Contacts Lookup View. 4. Publish Account and Contact entity. 5. Open a new Account form > Select a Parent Account from the lookup and see Primary Contact Lookup filter records based on the selected Parent Account. Thank you so much. I apologize for my lack of understanding. I thought that the "source" and "target" references were to be replaced with something else. You'll paste the above code on OnChange event of Primary Contact field.